Walking through Nuuk Art Museum you will find several works by Miki Jacobsen (b. 1965). In the small hallway in the middle of the building, a large painting hangs on the wall. It is painted with long and lightly flowing brush strokes. Acrylic on canvas. A mountain landscape in earthy colours against a blueish background. A snow covered mountain rises in the middle. A large red rock comes almost floating into the picture from the side. It is pointed and creates imbalance, thereby drawing attention to itself. The art piece is called Ruby II and is from 2007. Two paintings were exhibited together in Indre Strømninger (“Internal Currents”), an exhibition at Nuuk Art Museum the same year: Ruby I and Ruby II. Ruby I continued the landscape from the point where the red rock floats into Ruby II. Internal Currents was an exhibition by Miki Jacobsen and Camilla Nielsen (b. 1972), where the two artists exhibited works focusing on the ‘currents and orbits [cycles] of continuous transformation and transience, which we experience in the outer world and consequently also in our inner one’. Ruby I, the other half of the painting at Nuuk Art Museum, was later painted over and hangs now at a local lawyer’s office; thereby the artwork went through its own orbit [cycle] of continuous transformation. “But I did save some of the painting, out on the edge” Miki Jacobsen says – Ruby I still lives underneath the new picture. Both paintings are reproduced in the art and culture magazine Neriusaaq 1, 2008. Nuuk Art Museum’s painting Ruby II is not an image of a specific place – it is more like an inner landscape. The outer world which is actually being represented in the painting is the reddish stone, the ruby floating in from aside. “The image was my comment on whether or not private parties should be allowed to remove rubies from Greenland”, Miki Jacobsen says. The painting came into existence following an ongoing debate about rubies, after five locals had been caught going out to get gemstones with small hammers, which Greenlanders had indeed been doing for whole generations. They were fetched by helicopters and were ordered to stay away from the area, even though everyone is by law allowed to pick rocks from the nature. An international company had reported the expedition of the five locals as having a commercial purpose. 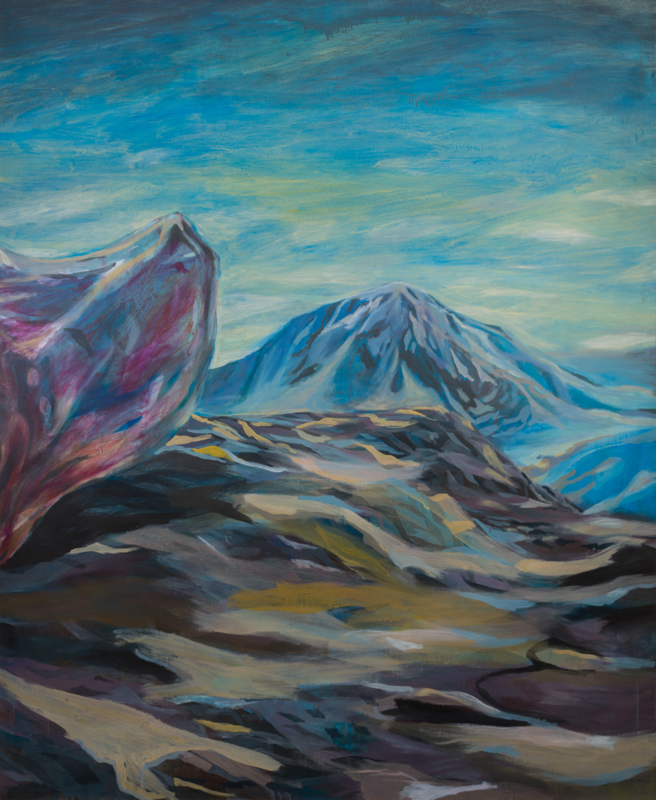 The discussion about Greenlanders not having the right to pick stones, at the same time as big foreign businesses were allowed to execute ‘test drillings’ for over a decade, taking away tons of material every year – that was the starting drive for the paintings, Miki Jacobsen says; both with giant red rubies in a mountainous landscape. In the hallway before the stairs to the upper floor, you will find Arferit / Hvaler (“Whales”), from 1995, created from driftwood found on the islands off Nuuk. The whales have the caudal fin up and swim towards the stairway. The driftwood was cut slightly off around the edges, but the form was essentially already there when Miki found the driftwood – the whales were already there. The eye is a button found on the beach and Miki Jacobsen has worked some ink into the wood, thereby creating the dark colour and shiny surface. Miki Jacobsen has always loved wood as a material to work with, because there are not many trees in Greenland – which is also why it is such a valuable material. He has created other pieces of art out of driftwood, where the starting point is always the form that the wood carries beforehand, and that it delivers to the artist through its long journey from faraway forests to the coasts of Greenland. As you walk upstairs you will find the painting Nanu from the 2000s. Just like with the paintings Ruby I & II, this painting has a direct reference to the outer world too, which is manifested by the creature placed in the middle of the picture. Roaring, with its sharp teeth and aggressively stiffen hairs, this bear almost turns into a mythical animal. The painting was realized with acrylic paint, and Jacobsen additionally used a texture product in order to create the thick fur on the creature. In the 2000s a polar bear called Knut from a zoo in Berlin became very popular in the media, being spotlighted as pet or a little teddy one could easily have at home. “This is my commentary on the media’s celebration of this baby polar bear,” says Miki Jacobsen. “You have to be careful, in nature just as overall, because these are professional killers: that is why I have made the teeth so huge”. Under the bear you can glimpse a tiny fox and a seal, because as Miki Jacobsen says foxes often follow polar bears hoping to catch some leftovers from the bear’s seal hunt. At the top of the painting it reads www.nanu.gl, which used to be Miki Jacobsen’s website. He does this in other paintings as well, as a way to sign his pieces. On the first floor of the building you will find the Culture Fusion pieces – two out of a photo montage of four. The other two montages are part of Nuuk Art Museum’s collection but are currently not exhibited. In one of the exhibited montages the signature www.jacobsen.gl can be seen standing across the snow mobile that Miki Jacobsen himself sits on; that website is no longer in use either. The photo montages were part of the exhibition The Red Snow Mobile at Nordatlantens Brygge in Copenhagen in 2005; an exhibition which attempted to focus on contemporary Greenlandic art as something else than soap stone figures, tooth carvings, masques and the more traditional expressions which are usually associated with Greenlandic art. With the Culture Fusion series, Miki Jacobsen wanted to add a bit of humour – not least to the debate around global warming. That also was a commentary to the fact that Greenland is today host to a mixed culture. The photographs in the montages are therefore mixed too: the dogs are photographed in Ilulissat, the airplane in Sisimiut, the sky in a third place and the snow bunting “probably in Nuuk”. This piece received much attention in the media. “People got in touch with me asking if they could use it as an illustration for articles about modern Greenland”. Today a poster of Culture Fusion can be purchased in the shop of Nuuk Art Museum. The exhibition Qaammatip Inua and other stories from Greenland could be visited from May through August 2016 at Nuuk Art Museum. There were on show watercolour paintings by Miki Jacobsen, the original illustrations to the book of the same title.